Never stop moving with our Cutting Edge Wireless Smart Band. Monitor your Heart Rate all day long with this slim, stylish device, and get the motivation you need to get out and be more active while you do it! It tracks steps, distance, and calories burned and shows you how you're stacking up against your daily goals. At night, it tracks your sleep cycle, helps you learn how to sleep better, and wakes you silently in the morning. Access your stats anytime from virtually ANY smartphone - both iPhone and Android. Activate the Anti Lost feature and never lose your phone again! This will become your perfect companion, it will be with you everywhere you go and it looks good no matter what you're wearing! Heart Rate Monitoring - Monitor Your Rate All Day Long!  EQUIPPED WITH A HEART RATE MONITOR  As seen on FOX, NBC, ABC & CBS! Use this revolutionary new device to track not only your heart rate, but steps taken, distance traveled, calories burned and active minutes. You get INSTANT REMINDERS when CALLS or TEXTS are coming in, plus you can activate the Anti Lost feature to get alerted when your Phone becomes too far from the Smart Band. Never risk losing your phone again! SETUP MANUAL AND VIDEO MANUAL INCLUDED. ✔ IMPROVE SLEEP PATTERNS AND HABITS WITHOUT DISTURBING YOUR PARTNER ✔ Monitor how long and well you sleep, and wake only you (not your partner) with a silent alarm. When charging, please understand only one side of the Smart Band has the USB charger as both bands can come off. ✔ ZERO EXTRA BULK TO YOUR DAILY ROUTINE! ✔ Slim, comfortable and easy to wear. You will barely feel like you have anything on your wrist at all. Make sure to follow the proper setup steps in the manual to ensure you are getting the best results from your Heart Rate Monitor and other features. 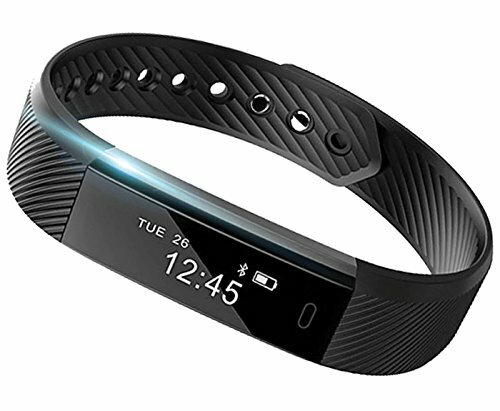 Both bands can come off on the Smart Band allowing you to change bands, but only one side of the Smart Band chip has the USB charging connector. Allow the Smart Band to charge for 4 hours before first use. ✔ ADVANCED BLUETOOTH TECHNOLOGY MAKES YOUR LIFE EASIER ✔ Sync stats wirelessly and automatically to virtually any and every brand/model of Smart Phone. You get to take advantage of Bluetooth 4.0 making connecting and transferring data to your Phone or mobile device a breeze every time. ✔ TAKE ADVANTAGE OF HELPFUL REMINDERS TO REACH YOUR GOALS QUICKER!! ✔ Set reminders to alert you when you have been sitting or motionless for too long. Take charge of your body today with our industry leading Smart Wristband! You'll get Serious versatility that can even transform your phone into a Remote Shooting Camera using the Smart Band to control the shots! ** Requires iOS 7.1 and above or Android 4.4 and above. This Smart Band Does NOT Work With WINDOWS PHONES.